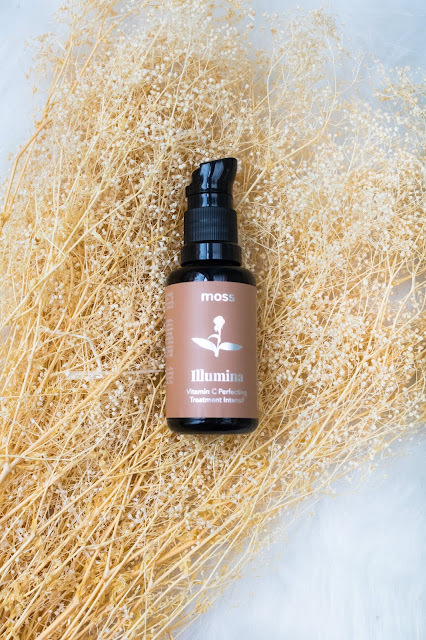 Ever since I came across Moss Skincare, I have always wanted to try them especially since the formulations looked right up my alley! Thanks to The Boxwalla subscription which featured Moss Skincare Beurre Celeste Cleansing Balm and Illumina Vitamin C Perfecting Treatment Intensif serum in their June 2018 Box! BTW if you aren't subscribed to The Boxwalla I highly highly recommend to do so if you are interested in trying luxurious green beauty products! It's the BEST green beauty subscription box in the market. Period! Coming back to Moss Skincare, Illumina Vitamin C Perfecting Treatment Intensif serum (that's quite a mouthful) is Vitamin C and exfoliating serum in one. It uses Sodium Ascorbyl Phosphate which is a stable form of Vit C and Pumpkin Enzymes to gently exfoliate the skin. The formulation also includes Moth Bean extract which is botanical form of Vit A similar to Retinol. Retinol can be harsh and not everyone can tolerate it, Moth Bean extract has shown to give similar results as Retinol but without causing any irritation. Research has shown it helps to boost cell turnover and reverse signs of sun damage and hyperpigmentation. The serum also contains White Willow Bark extract which is botanical form of BHA ie Salicylic Acid, one of my favorite ingredient to decongest the skin and keep it clear. It also contains Plant ceramides which helps to strengthen the skin barrier. 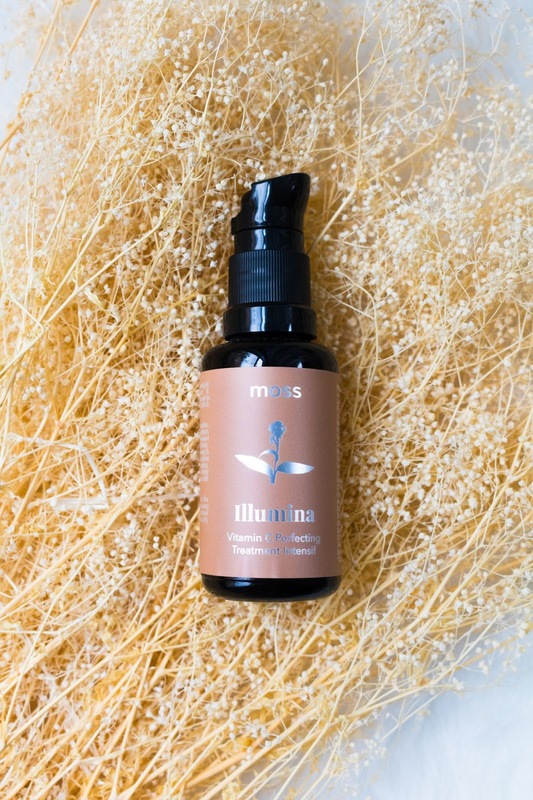 I have been using Illumina serum consistently for past few weeks every single night and let me tell you this stuff works! If you are a regular reader of my blog/instagram you know I swear by my Epionce Lytic Plus Tx lotion to keep my skin free of congestion/clogged pores but ever since I started using Illumina I haven't touched Lytic Plus Tx Lotion! This serum is quite potent and even though Celestyna the owner and creator of Moss Skincare suggests to use it every other night I could tolerate it every night without any irritations. Please remember I have been using chemical exfoliators on my skin for quite few years and have slowly build up the tolerance, if you are new to chemical exfoliators and vitamin c serums I would suggest to use 2-3 times a week first and then slowly build up to everyday usage depending upon your skin condition. The serum is light weight and has lotion type consistency, it absorbs beautifully in the skin without leaving any sort of residue behind. I find 2-3 pumps are more than enough for the entire face and neck. I directly apply it after cleansing my face before applying any serums or moisturisers. This is one of those serums where you see the results overnight! 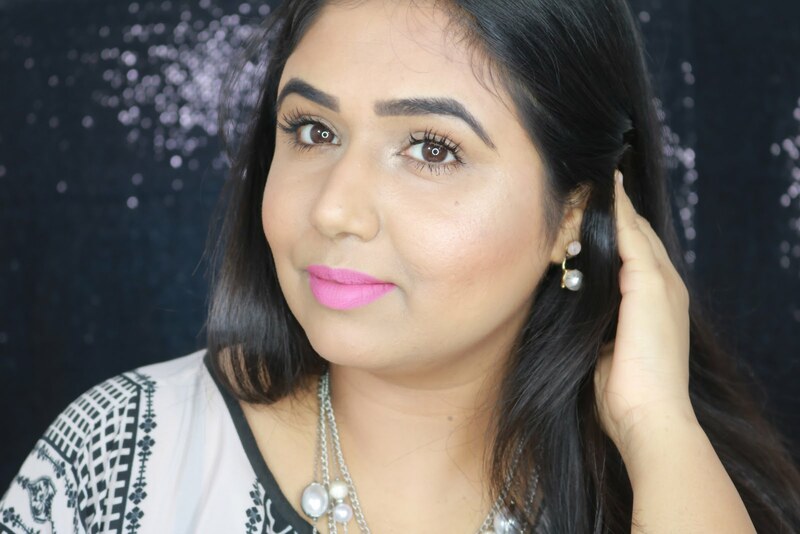 My skin feels bright and even toned in the morning! It literally makes my skin glow and I don't say that lightly! I don't get hormonal acne anymore but do get congestion sometimes and using this serum it has helped me to keep breakouts at bay. It definitely helps with lightening of the dark spots and previous acne lesions. The biggest change for me was softening of the scars! With regular usage I found my deep rooted scars have softened quite a bit and skin looks more healthy and luminous. It has become one of my favorite discoveries of this year! Having said all that I have heard this serum purges but I personally did not face any purging, probably because I am used to using stronger exfoliating serums but if you are unsure I would recommend to get a sample to try first! Overall highly impressed by this serum and would definitely recommend it in a heartbeat! This serum retails for 145$ for 30ml, it's definitely expensive and as much as I respect Celestyna for her knowledge and formulations, I know not everyone can afford to spend 145$ on a single product. But if you want to try one product from Moss definitely check Illumina out..it works! You can buy Moss Skincare products at Aurora Beauty my favorite retailer for all things green beauty! Also don't forget to use the code "PARITA15" to get 15% off your entire order! This is non affiliate code ie I do not gain anything in return if you use my code other than your love and support :) Plus it's the only green beauty retailer who offers free shipping over 50$ with samples! You can also buy samples of products you want to try, I personally have bought samples from her many times and they are always very generous sizes! I hope this review was helpful and if you have any questions please feel to free to leave them below in the comments and I will definitely get back to you asap. Disclaimer - Boxwalla June 2018 Beauty Box was sent to me for consideration, however all my reviews are non biased and my own. This is NOT a sponsored post. References - Paul, B., 2018. Zinc Testosterone Research Study: Benefits, Dosage & Side Effects Guide. [WWW Document]. Testosteroneofficial.com ie. Testosterone Official. URL https://testosteroneofficial.com/research/zinc/ (accessed 12.1.18).